“Mary” ‘s close and blue. you might do that much! in his mouth’s a moth. Certain cultures believe that when you dream, your soul becomes a moth that travels the world. For this reason, some African tribes don’t allow cats where they sleep because their souls may be captured before they wake. This is what comes to mind when I read Elizabeth Bishop’s poem Sunday, 4 a.m. This poem was written in Brazil in 1956, the year Bishop won the Putlizer for her book North & South. She had been in Brazil for five years, arriving there from New York in 1951 to visit friends Mary Stearns Morse and Lota de Soares. She’d met the couple in New York in 1942 and arrived in Brazil for a visit, intending on staying only a few weeks. After several delays, she decided to remain indefinitely. Soares later became Bishop’s partner, and Bishop remained in Brazil off and on for the next 20 years. When Soares died in 1967, Bishop and Morse were the two heirs to the Soares’ estate. In this poem, we see the world of Bishop’s Brazilian house. I imagine her looking around her room and seeing the tick-tack-toe scenery of Brazil through her window. She later paints the landscape as a puzzle of squares, crosses and dots. She wakes in the early morning light and sees a statue of the Virgin Mary in a recess of the wall. The image of Mary in her blue robes reminds her of a crucifix and the cross- and wheel-studded landscape out the window. In earlier drafts of this poem, the landscape is crucifix- and nail-studded. With the crucifixion in mind, she thinks of a knife box full of rusty nails in the kitchen, and from somewhere outside the window someone yells, It’s always the same. There’s so much work to be done and you’re off doing who knows what. The horse needs shoeing! Can’t you at least do that much! The old kitchen knife box is full of rusty nails, rusty thoughts, the way we speak to one another, our nagging concerns. A few lines later the cat enters the poem with the moth in its mouth. The word moth brings to mind the 1946 poem by Bishop called The Man Moth. In that poem, a nervous, flittery man moth tries to fly to the moon but remains trapped on earth. In Sunday, 4 a.m., the moth is caught in the mouth of the cat. This is how this poem works. From one image to another, we follow the mind of the speaker as she lies in bed in a half-dream state. She is in that thin place between worlds in the early morning hours. This kind of poem, phanopoeia, varies from logopoeia, which follows a storyline. In phanopoeia, we receive layer after layer of image: landscape, crucifix, Mary, knife box, horse, cloth, cat, moth, brook, stair, bird song. There is no plot, narrative or sequence of events for the reader to follow. Bishop also uses rhyme scheme in this poem. Rhymed words determine where the poem goes. She needs a word to rhyme with stair and decides on bare. In her first draft, a picture is bare instead of a cupboard. It later changes to cupboard, which is more specific and reminds us of the knife box in the kitchen. & now the picture’s bare. The cat has gone a’hunting. This is where the poem opens for me. I begin to see what lies behind the images. A gray mind tries to nail down broken spaces but dangles, is incapable of nailing down the gray places in her mind. These words aren’t published but show up beneath the surface of the text. The reader can sense them in the way the words are structured, in the style of poem chosen, in the voice and tone of the poet. These broken spaces dangle in the mind. 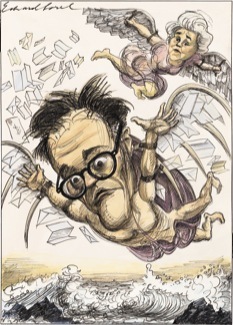 The word gray appears in the poem earlier. The gray horse needs shoeing, the gray horse needs nailed down. It’s always the same! What is there beyond the frame of the mind, beyond our eyes. What is it we think when we turn inward and detach from our surroundings? Surrounding the poem is the idea of subordinance, of people under the rule of the church and government. She uses the words vox humana, the voice of mankind, in line 11, to suggest Latin chant in a Catholic church service. Brazil currently has the largest concentration of Catholics in the world. More than 73 percent of the population is Catholic. This could have been true in the 1950s as well. She must have been surrounded by images of the Virgin Mary and crucifixes. We are thinking of the nails in the hand of Christ on the cross, we are thinking of nails in the mind of people confronted with the price for their sins. 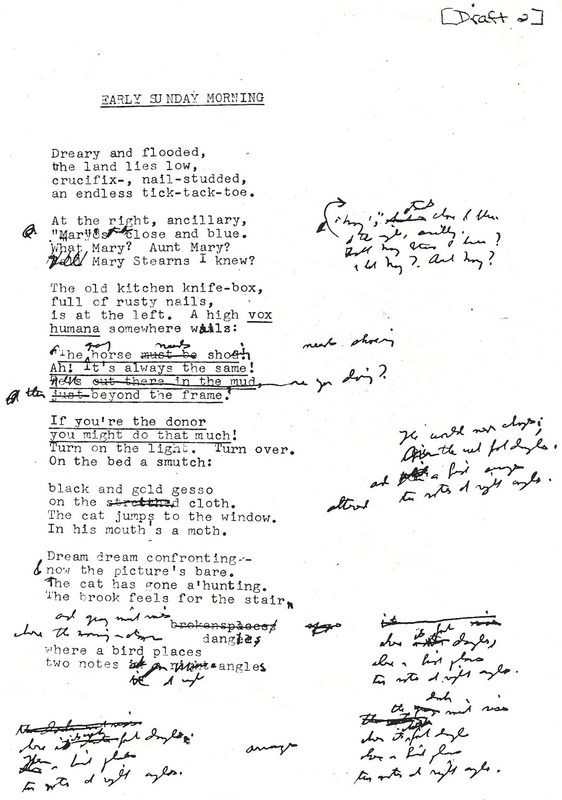 If we look at the beginning of the poem, we see that dreams are lying low. It’s hard to piece together the broken places in our mind if what we think is secondary to the whole. The cloth has been altered, the dreams have been altered. Mary’s close and blue, like the sky. The poem ends at right angles. On our right, we see Mary Mother of God, on our left is the old kitchen knife box. We turn from right to left in the bed, we turn from the woman lying next to us to a statue of a woman in a recess of the wall. The wet foot dangles in the waters of this life, in this culture, in this home, in a world it is trying to be part of, in a place confronted with dreams. in my poetry — only to please myself. Why do you write poetry? What about it, as a genre, appeals to you over other writing forms? Well, who knows really? I began when I was very young, about eight. I was very isolated as a child and perhaps poetry was my way of making familiar what I saw around me. Many things probably contributed to this. For example, my Nova Scotia grandmother was a great hymn singer. I grew up with those sounds, and, in fact, still have hundred of them floating around my head. My aunt, like so many Victorians, belonged to the village’s poetry society and she recited a great deal to me — Longfellow, Browning, Tennyson. So obviously I memorized a lot and it soon became an unconscious part of me. Poetry has always seemed the most natural way of saying what I feel. I never intended to “be” a poet, as I think people set out to do today. I never wanted to think about any label. It’s far more important to just keep writing poetry than to think of yourself as a poet whose job is to write poetry all the time. What do such people do during those long, infertile periods? Poetry should be as unconscious as possible. Does a poem begin for you with a sound, an image or an idea? It differs with every single poem. Some poems begin as a set of words that you aren’t sure what they apply to, but eventually they accumulate and become lines, and then you see some pattern emerge. Sometimes an idea haunts me for a long time, though poems that start as ideas are much harder to write. It’s easier when they start out with a set of words that sound nice and don’t make much sense but eventually reveal their purpose. Again, the unconscious quality is very important. You don’t ask a poem what it means, you have to let it tell you. How long do you carry a poem in your head before committing it to paper? From 10 minutes to 40 years. One of the few good qualities I think I have as a poet is patience. I have endless patience. Sometimes I feel I should be angry at myself for being willing to wait 20 years for a poem to get finished, but I don’t think a good poet can afford to be in a rush. One thing I love about your poetry is its ability to render the ordinary extraordinary, to make us look again and again at the familiar. Is this a conscious motive on your part? I’m not trying to do anything specific in my poetry — only to please myself. The greatest challenge, for me, is to try and express difficult thoughts in plain language. I prize clarity and simplicity. I like to present complicated or mysterious ideas in the simplest ways possible. This is a discipline which many poets don’t see as important as I do. Complexity, I think, often obscures fuzzy thinking or verse masking as poetry. If poetry isn’t disciplined then probably the eye which observed or the mind which translated the experience lacked a certain discipline. One senses that you are not observing an object for the first time, but rather returning to it again and again to capture its “otherness.” Will you comment? I am very object-struck. Critics have often written that I write more about things than people. This isn’t conscious on my part. I simply try to see things afresh. A certain curiosity about the world around is one of the most important things in life. It’s behind almost all poetry. I am very fond on painting and this may account for some of my interest in observing things closely. My aunts sketched and painted watercolor and this may have subtly influenced me. In fact, I often wish I had been born a painter rather than a writer. Bishop’s writing studio in Samambaia, Brazil. This mysterious thing we call inspiration isn’t that easy to pinpoint. But it’s the strange and wonderful thing about writing poetry — you can never predict where or when or even why something moves you to write a poem. That’s what I mean when I said a poem comes in many guises. A poem may be inspired by something that happened 20 years ago but until I’ve written it, I may not have realized that at the time I was greatly moved. I think you have a trust that the eye and mind are constantly recording, and be patient enough for them to reveal what they have observed…. Your poems employ extensive imagery of maps and geography. Could you discuss why? Well, my mother’s family wandered a lot and loved this strange world of travel. My first poem in my first book was inspired when I was sitting on the floor, one New Year’s Eve in Greenwich Village, after I graduated from college. I was staring at a map. The poem wrote itself. People will say that it corresponded to some part of me which I was unaware of at the time. This may be true. Geography III, in part, concerns itself with the search for and definition of home. Is writing poetry your way of finding or having that home? Interestingly enough, many of those poems were written when I decided to leave Brazil where I had lived for a long time. This may have contributed to this feeling. I’ve never felt particularly homeless, but, then, I’ve never felt particularly at home. I guess that’s a pretty good description of a poet’s sense of home. He carries it within him…. 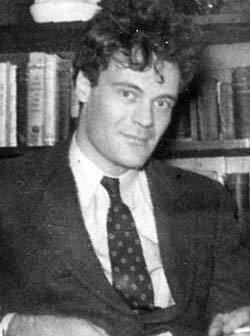 You have resisted almost every temptation to which both good and bad poets yield today — such as confessional or obscurely structural poetry. Have you always had a true sense of your poetic voice? No, I haven’t This used to worry me a great deal and still does. In my first book, I was worried that none of the poems went together, that there was no discernible theme. I feel this about everything I’ve ever done. But apparently this is a consistent voice. I am grateful but astounded to hear this. 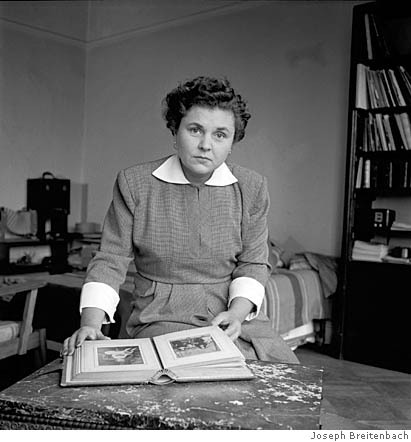 Yet in almost every poem one hears the calm, consistent voice of Elizabeth Bishop. Does this happen naturally, then? Well, I’m not calm, but it’s nice to hear! I never think of any tone when writing. It just comes, I guess…. 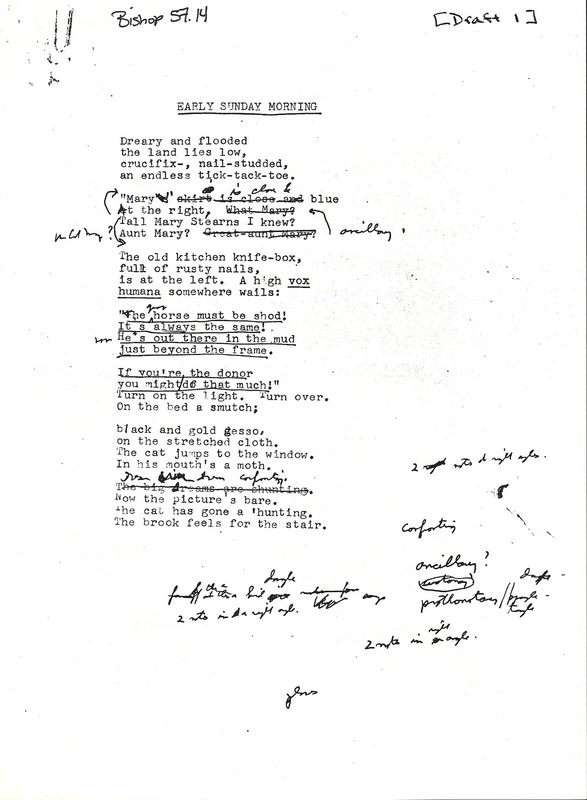 A final question: What one quality should every poem have? Surprise. The subject and the language which conveys it should surprise you. You should be surprised at seeing something new and strangely alive. There are things in each of us as humans so fragile they exist nowhere except in ourselves. 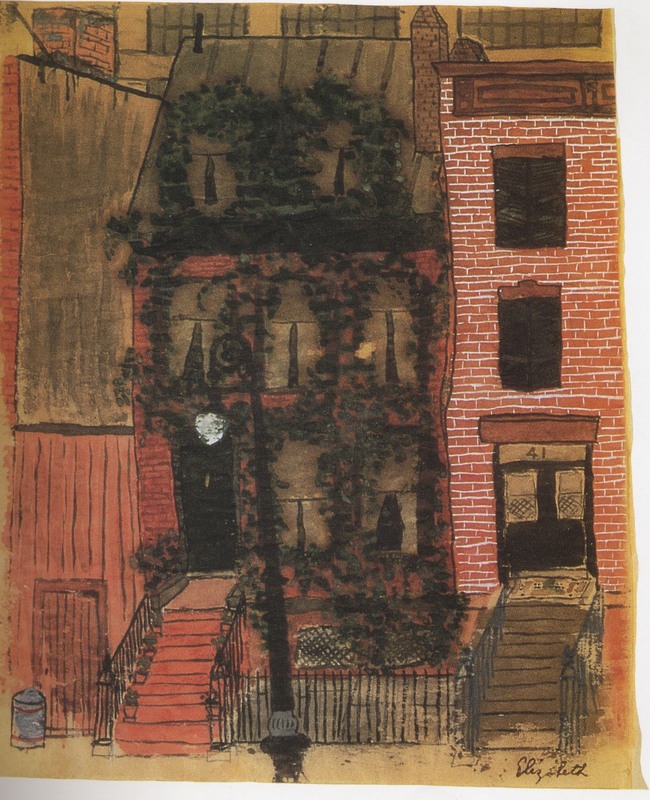 These watercolors by Bishop seem like fragile pieces of the poet, each a small poem in a way, providing some glimpse into the interior of her life. In 1977, she wrote in a letter to some friends, How I wish I’d been a painter . . . that must really be the best profession — none of this fiddling around with words — there are a couple of Daumiers at the Phillips that make me feel my whole life has been wasted. The paintings in this post are from the book Exchanging Hats, published in 1996. 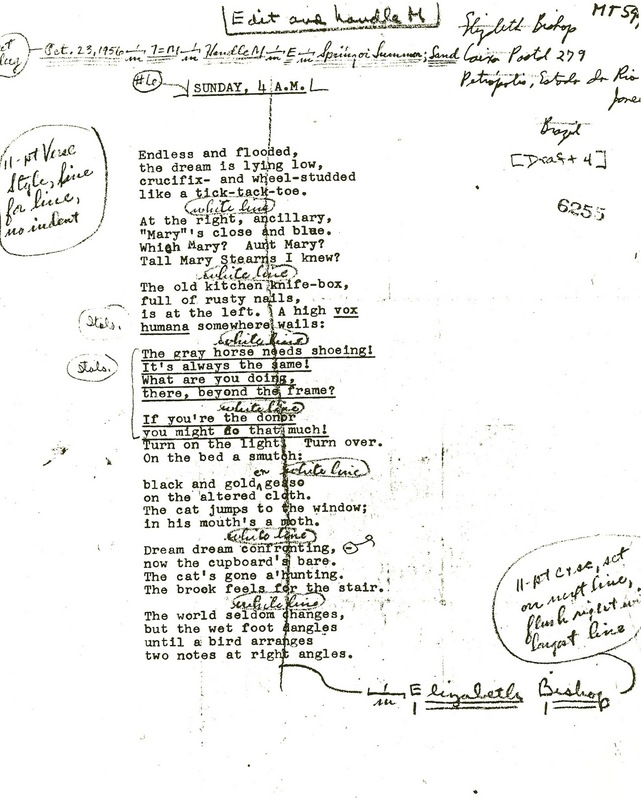 The text in parenthesis by the title is from the editor, William Benton. 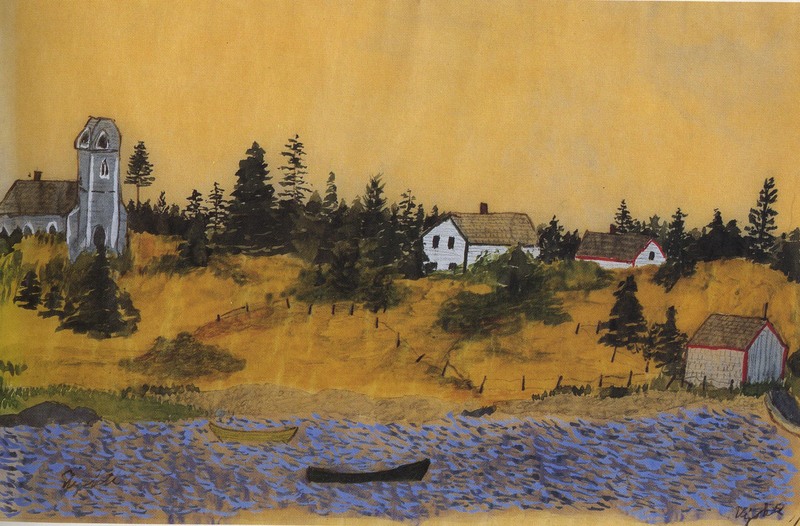 Nova Scotia Landscape: What interests me about this painting are the colors she chooses. The pale blue of the waves seem to be diffused with light. By painting the lake in the foreground, she gives us a sense of space, a wide area of water and a landscape that expands out from that. The lake dominates the foreground as a living, working cluster of brushstrokes crowded together to form its own sky. The water gives a sense of time and motion, splinters in time and the illusion of movement. She uses flat, overlapping strokes to form the water as Van Gogh sometimes does. back-to-back, feeding, and a slanting stick. 41 Charles Street (A candidate for Bishop’s earliest-known painting. 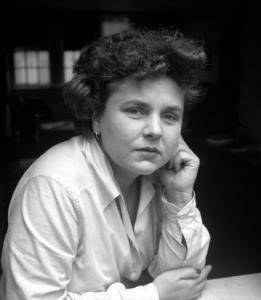 In 1934, she lived at 16 Charles Street in New York’s Greenwich Village – a block away from number 41.) In many of Bishop’s paintings we see layers of bricks. The repeated patterns here train our eyes on the painting in the same way the brush strokes do on the lake in Nova Scotia Landscape. 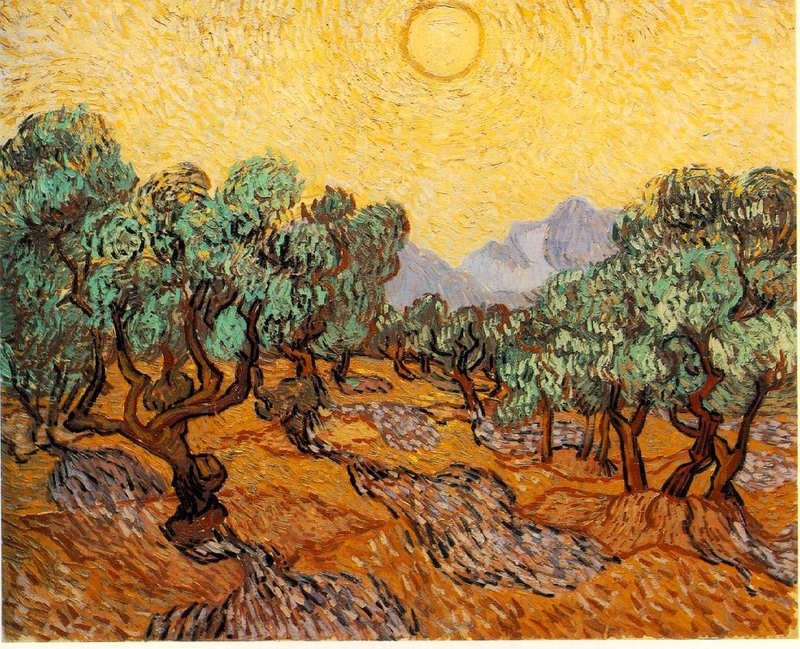 Repeated patterns in painting as in poetry give the image a sense of rhythm. They remind us that patterns are everywhere in the shapes and figures around us and that familiarity gives our world a sense of balance. Sha-Sha (Sha-Sha is the nickname of Charlotte Russell, a Florida friend of Bishop’s. 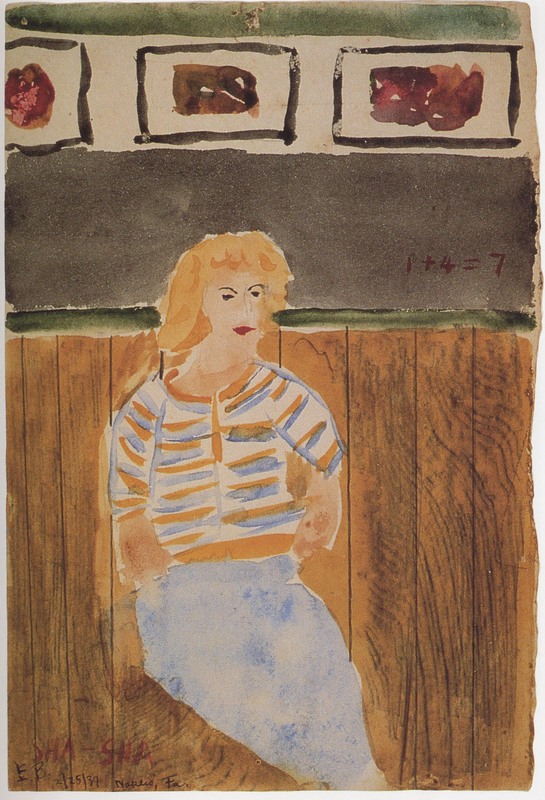 It would be nice to know the story behind the silly arithmetic 1 + 4 = 7; although something of the same spirit exists in the relation between the loosely handled figure and the fancy realism of the wood grain, complete with mildew.) I’m not sure what Charlotte Russell looked like, but I know how difficult it is to paint a human figure. Once again, we see a pattern in her sweater and in the wood grain. Sha Sha is set against the wavelike pattern in the wood, as if she’s not part of the natural world. When you paint a person, you want to communicate some level of experience you have with them. Sha Sha seems only a decorative part of this world set against the shifting patterns behind her. Even though this painting seems partly doodled because Bishop didn’t finish the arms, the light complexion of Sha Sha and the spring-like color in her clothes set against the dark complexity of the wood suggest to me the relationship between the two women, light and dark. Palais Du Senat (Henry Miller, a fellow watercolorist, wrote ecstatically about his discovery of Chinese white. Bishop uses it off and on in her work, here perhaps for the first time.) 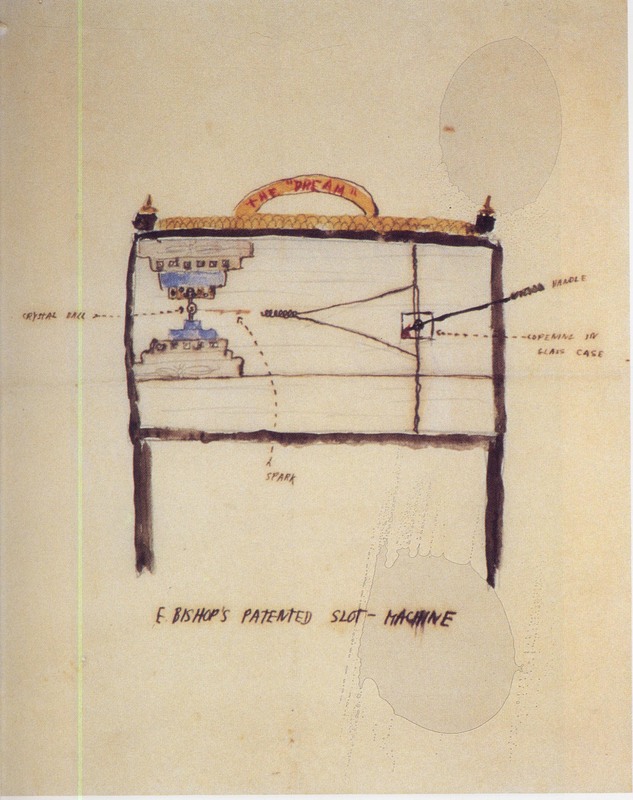 When I look at Bishop’s paintings, I often question what perspective I would use if I were doing the same one. 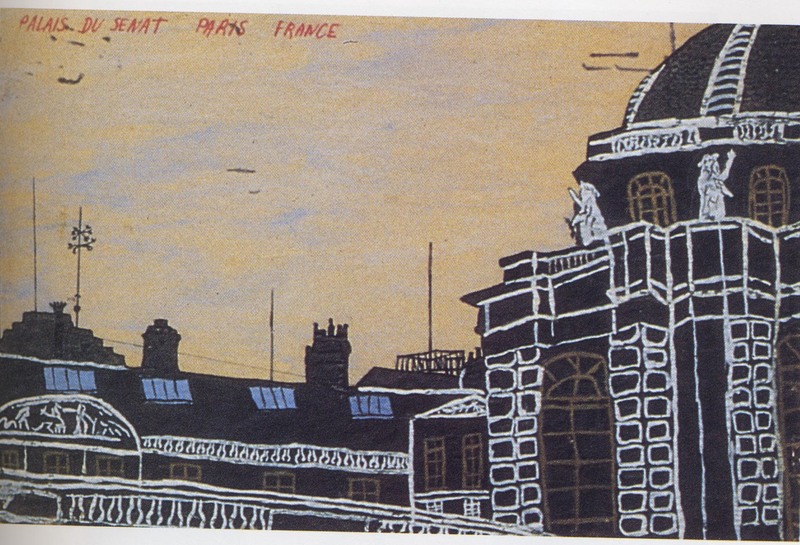 Here she paints the tops of these buildings against a pale sky. The Chinese white makes the buildings more three-dimensional than the figure of Sha Sha is. To paint roofs and windows and walls and solid spaces in contrast to a washed open sky, you must know how to build up the surface of the building to make it look powerful enough to stand on its own. Contrasting white with black gives any painting a sense of detail and structure. Sleeping Figure (The figure here is Louise Crane, with whom Bishop traveled in Europe and lived in Key West. They were lifelong friends.) Louise Crane met Bishop at Vassar in 1930. 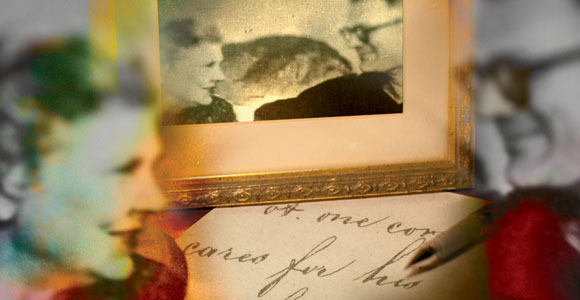 The two traveled extensively in Europe and bought a house together in Key West in 1937. Crane’s father was a millionaire and her mother founded MoMA, the Museum of Modern Art in New York. She and Crane toured many art galleries together while they were in Europe, and this may have contributed to Bishop’s desire to paint. Bishop’s paintings don’t have shadows or contrasts in delicate grays or blacks. They are point blank tone color next to tone color. There are no mists in Bishop’s paintings or the difficult graduating of tone. One central figure usually dominates the image. 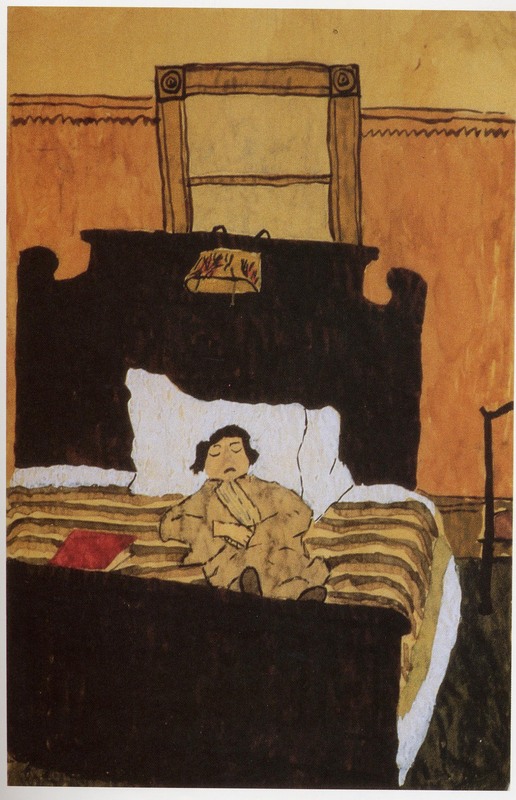 She paints Crane here asleep in a bed. Crane looks small and distant in the patterns of the blanketed wood-framed bed and not as sturdy as the wooden panels surrounding her. She seems impossibly small in relation to her heavy surroundings and almost untouchable. She lies in contrast to the horizontal lines of the blanket, stuck and unmovable, not going with the flow but firm-lipped and stolidly wrapped in her robe and scarf. E. Bishop’s Patented Slot-Machine (The rainbow arc at the top of the picture – resembling the handle of a suitcase – bears the legend “The Dream.” In the diagram of the slot machine the notations read: “Crystal Ball; spark: handle; opening in glass case.” The two sets of numbers are: 2 3 8 10 7 1 and 3 2 5 4 1.) This is one of the most fascinating paintings by Bishop. How is a slot machine a dream? A dream is a response within us in search of new ways to respond to our emotions. But this is a thing made of metal and wood, a strange surreal house with a crystal ball. This hollow image with its openings and closings is assembled in the center of the painting. It isn’t three dimensional but flat and square. The contraption is an expression of opportunity, the different ways numbers can fall and are woven with fate. This dream is a simply constructed machine, but it enjoys the challenges of effort and numerous directions our lives can take. 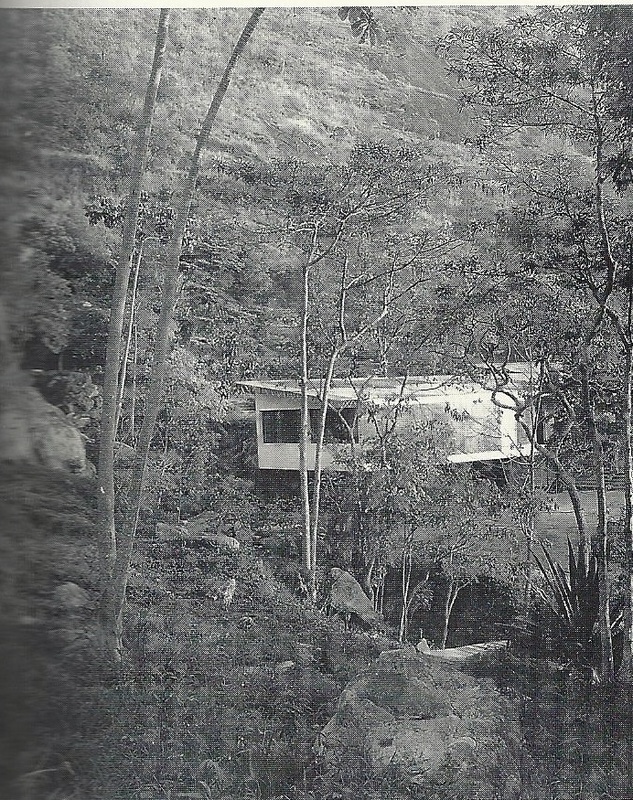 Interior with Calder Mobile (The interior of Samambaia, the house built by Lota near Petropolis, in the mountains outside Rio de Janeiro, where she and Bishop lived. Rosinha Leao, to whom it is inscribed, was a friend of theirs in Brazil.) Lota de Soares was Bishop’s domestic partner for 15 years. Another thing that interests me about Bishop’s paintings is what she chooses to paint, interior and exterior landscapes. Her book titles also reflect this same relationship to space: North & South, Questions of Travel, Geography III. 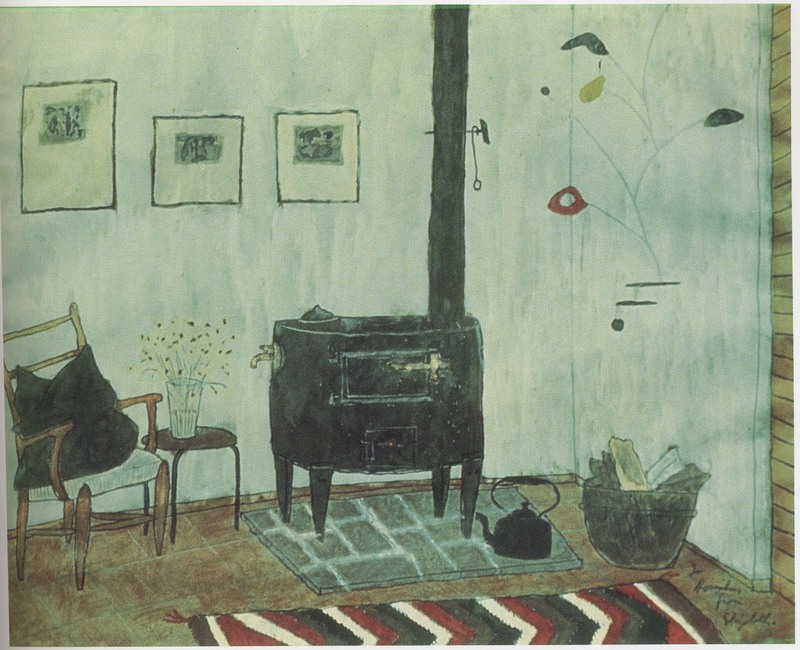 This painting celebrates the warm interior space around a stove. 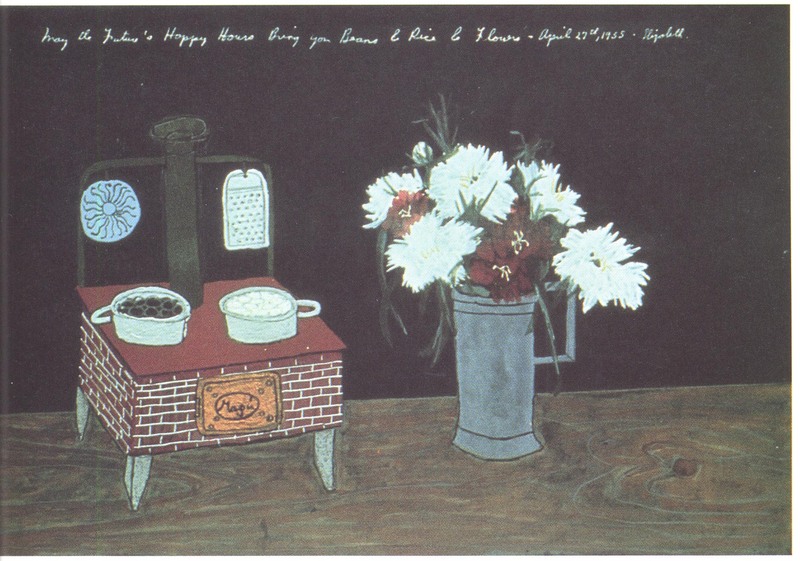 The placement of the stove is juxtaposed with a mobile, the desire in the painting and perhaps in the painter for imagination and spontaneity. Life isn’t all solid and stable. Part of it is out of control. The mobile represents a more abstract part of Bishop’s mind, one that isn’t grounded in reality. It’s not furniture, it’s not flowers, it’s not bricks, it’s a floating, evolving object, like planets revolving in space. Some of Bishop’s paintings have softer edges than others. Red Stove and Flowers, emphasized by a black background and a red brick box is very simple to take in visually. Red box, blue circle, two pans with opposite facing handles. It’s a study in balance. Everything has its place. All the shapes fit in a space inside the puzzle. It’s a simple, strong painting about the most important things in life, food for our bodies and beauty for our souls. 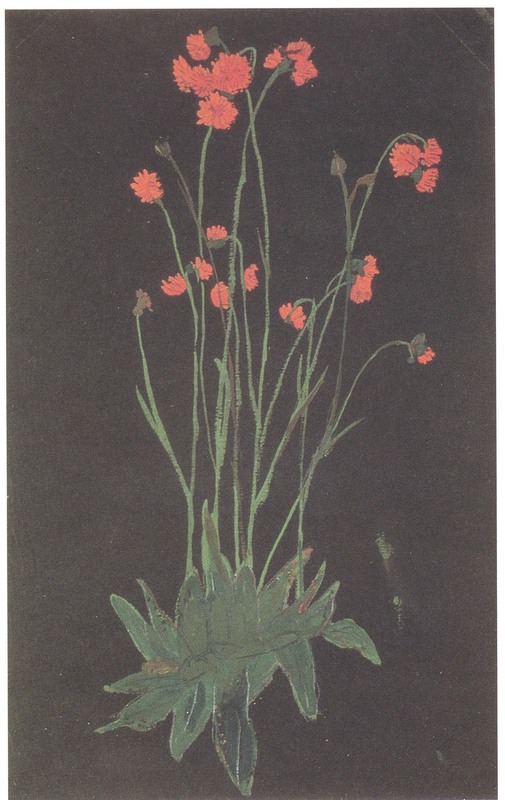 Red Flowers on Black Devil’s Paintbrush was painted in Maine a year or two before Bishop’s death. I have made numerous attempts to paint red flowers and appreciate that Bishop came up with a way to do it using a black background to give the petals a sense of delicacy. Alienating the slender flowers in the black space brings out the intention of the flowers and how we are to relate to their fragility. Our eyes are drawn to the arch of the stems. 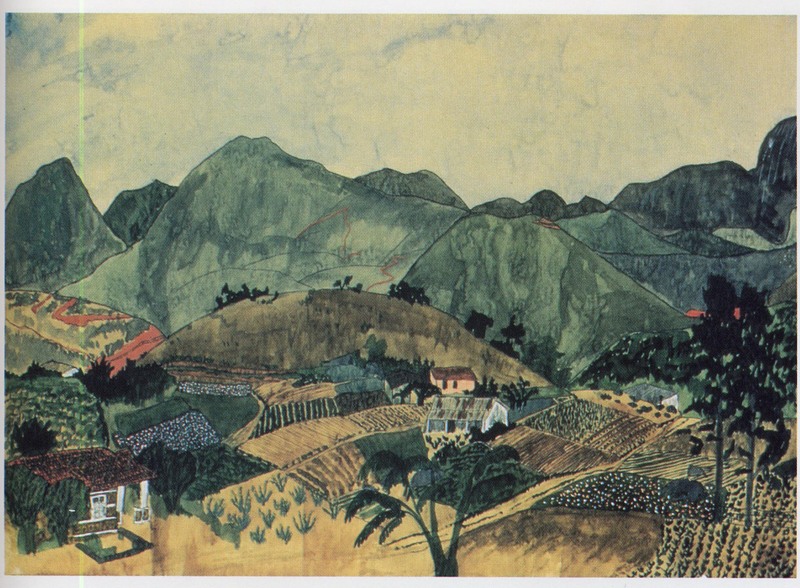 In this painting as in all of Bishop’s paintings, she recreated the images as authentically as her skill allowed. Magritte said, “The language of authenticity ‘gives the word’ to words by making them say what they never said.” In other words, representing something as authentically as we can gives it all the depth and mystery it needs. Pansies (Ambitious in its realism, it is also, as far as we know, Bishop’s largest painting 12 1/2 x 15 inches.) These pansies in contrast to the red flowers are surrounded by patterns. The weave in the basket and the vertical and horizontal lines in the tablecloth give our eyes a lot to take in. 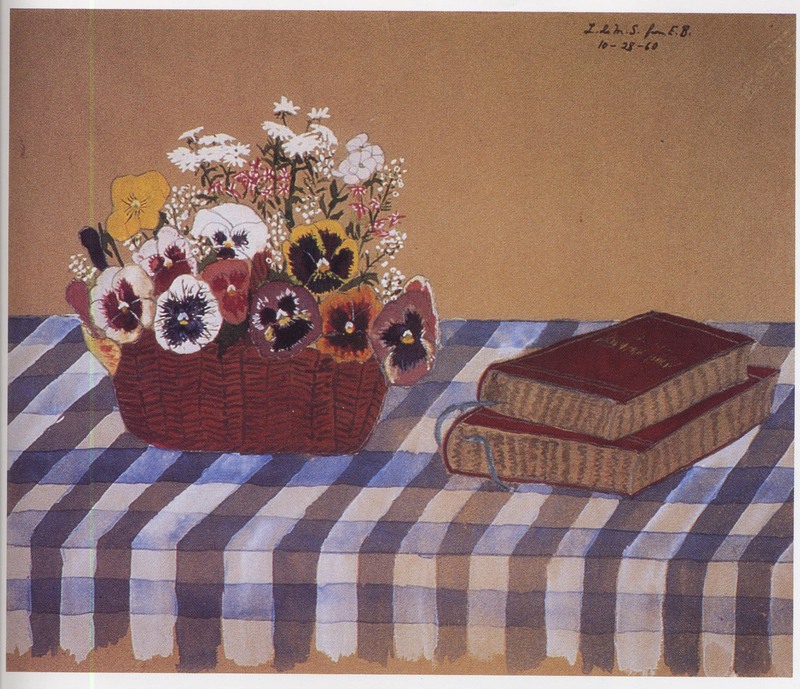 The circular shapes of the flowers contrast the square patterning in the cloth and the books. When I look at a painting, I ask myself what I would add or delete if I were painting the same thing. There are no unwanted objects in this painting, and the objects find relief by being placed inside patterns as the subjects often do in Bishop’s poems. Brazilian Landscape There are so many places for the eye to go in this painting, it’s hard to take it all in at once. Thick and thin strokes, short and long lines end up on top of each other. This is a painting almost entirely about movement and about efficiency of space, fitting in a landscape so that all the surfaces meet each other at the right places. It’s made more complex with dots and a rich mix of colors. No particular object dominates the painting. It’s a package of details. 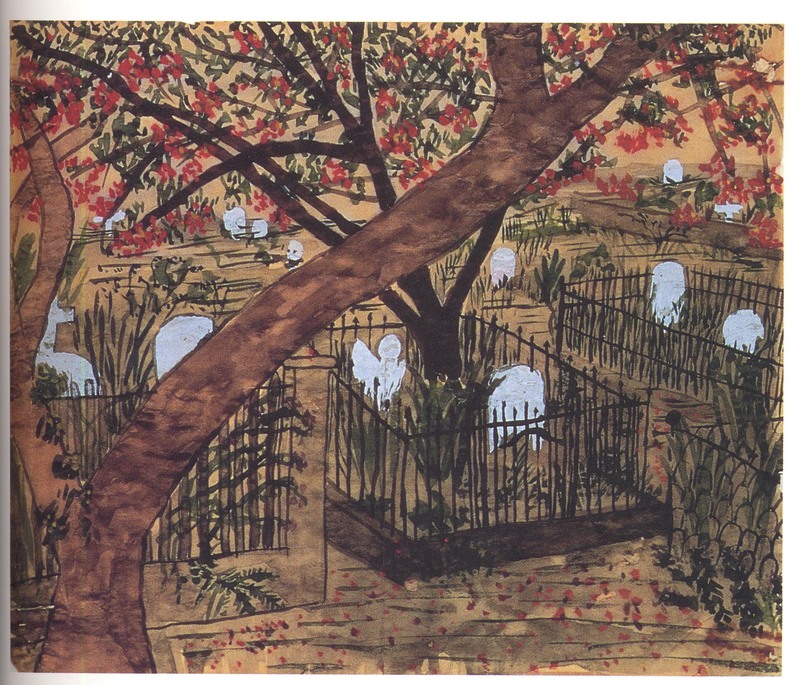 Graveyard with fenced Graves The Poinciana Tree in Key West, also called The Flame Tree, is said to be one of the world’s most colorful trees. 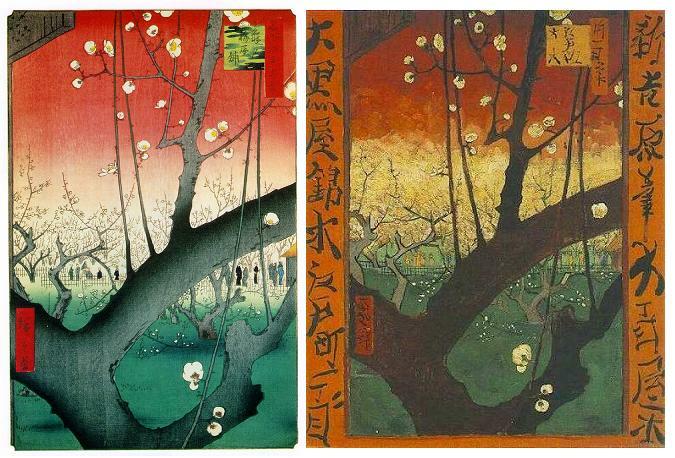 When I see this painting by Bishop, I think of the Japanese woodcut by Hiroshige that Van Gogh made a copy of. 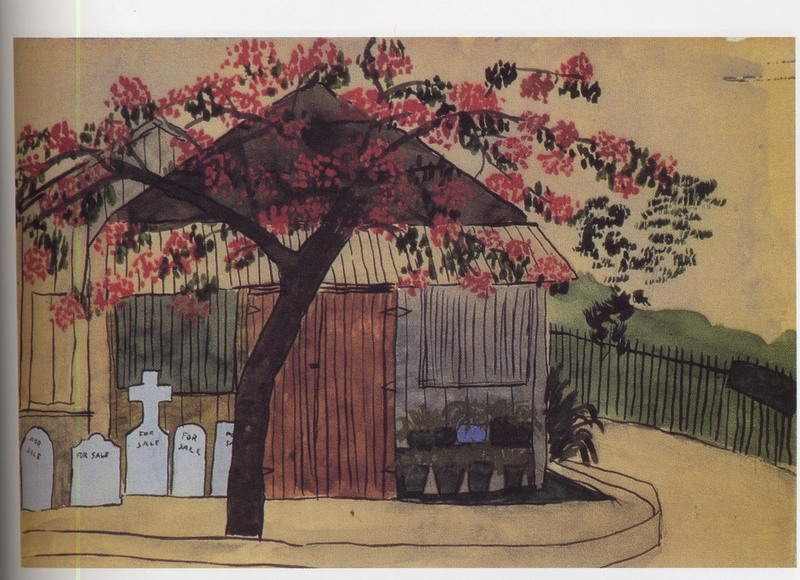 When Bishop painted her poinciana tree, she must have had the Hiroshige/Van Gogh plum tree image in mind. In looking at both Bishop’s paintings and poetry, I have been trying to discover more about the person behind the work. There are no sensuous surfaces in either her paintings or poems but reality made in thin brush strokes. These paintings represent an intuited need in Bishop to express the limpid fluidity of her own life. She stands back away from her subjects and regards them, not with thick heavy brush strokes or harsh outlines but with a close embrace of details and a strong sense of composition. In many paintings, I see a woman not surrounded by a whorl of activity but a woman sitting alone in a room, trying to discover her place in the space she finds herself in. She painted what presented itself to her in dimly lit rooms. She was a watercolorist, and all these paintings of rooms and islands and flowers and horizons originally lived in water, something that’s never solid. There’s a mutability about watercolor we don’t have with oil. I think flowers are anchored better in water than they are in oil. It suggests the vulnerability of the image. The 42 paintings in Exchanging Hats represent their own form of lyrical interludes in Bishop’s life. It was a new way for her to absorb the details around her. What interests me about both the poetry and paintings of Bishop is that underneath the surface of her text or her paint seems to be something else waiting to reveal itself, another poem, another painting. In her art, whatever form it takes, are things, objects, places she manages to save on paper and beneath the surface of each lies a mystery. I read one of her poems and think, there must be something I’m missing. So I read it again, searching for what lies beneath the exterior, a song of love or of pain or of some vision she had of life, some truth about the human condition. I search to find the dress, the child, the dog beneath the open sea. who looked at it sometimes, or didn’t bother to. It’s behind—I can almost remember the farmer’s name. Would that be Miss Gillespie’s house? You know, he was quite famous, an R.A……..
art “copying from life” and life itself. they’ve turned into each other. Which is which? Bishop and Lowell met at a dinner party in 1947 when she was 36 and he was 30 and corresponded for the next 30 years. 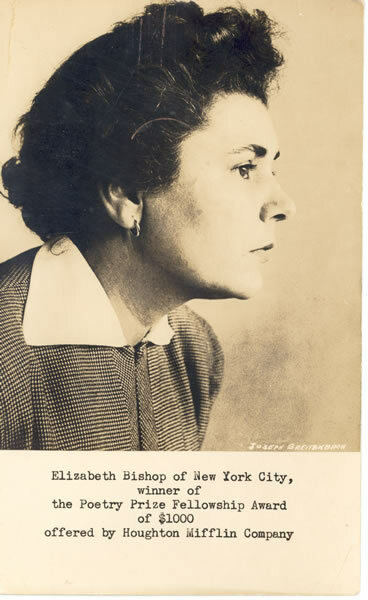 Bishop said, “I remember thinking that it was the first time I had ever actually talked with someone about how one writes poetry — and thinking that it was, that it could be, strangely easy. Like exchanging recipes for making a cake."